The Religious Liberty Partnership (RLP) just concluded its annual consultation last week in the Brazilian capital city of Brasilia, with 80 key leaders from 24 countries participating. The World Evangelical Alliance (WEA) was represented by its Religious Liberty Commission, its International Institute for Religious Freedom and other leaders from its constituency. Having held previous international consultations in Europe, South Asia, Turkey, North America and South East Asia, this was the first time in its 11-year history the RLP consultation was in Latin America. 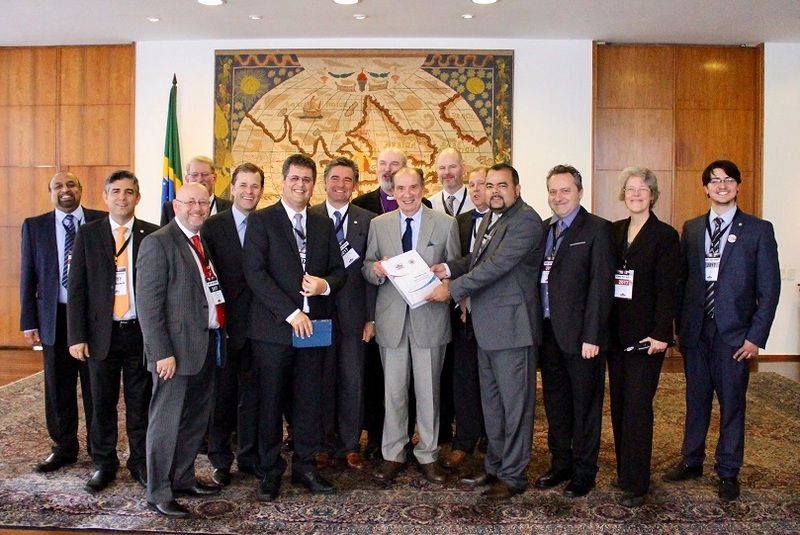 Hosted by the Brazil-based organization, ANAJURE (the National Association of Evangelical Christian Lawyers), the event included closed plenaries for the planning of joint actions in defense of international religious liberty and a public seminar held at the Brazil Federal Senate on the protection of religious freedom for all faiths. Speakers at the RLP Consultation included Federal Deputy Leonardo Quintão, President of the Parliamentary Coalition for Refugees and Humanitarian Aid of the Brazilian National Congress; Dr. Gerardo Amarilla, former chairman of the House of Representatives in Uruguay; Dr. Davi Charles Gomes, Chancellor of Mackenzie Presbyterian University, and Russell Stendal, a key player in the recent peace agreement in Colombia. The group also had audiences with Brazil President Michel Temer; the Minister of Foreign Affairs, Chancellor Aloysio Nunes; the Federal Senate and Chamber of Members. "Thanks to the efforts of ANAJURE and Deputy Leonardo Quintao, we were able to have significant meetings both with Chancellor Nunes and President Temer,” said RLP Chairman Mervyn Thomas of Christian Solidarity Worldwide in the UK. “Both men showed a deep understanding of the issues surrounding international religious freedom, and indeed appeared to be fully committed to playing their part in promoting it." 1 Documentation released by the Pew Research Center has showed Brazil with the fewest religious restrictions in the world, see here. > Sign up for our Religious Liberty Prayer Alerts and the Religious Liberty Research & Analysis Reports. > Participate in the International Day of Prayer for the Persecuted Church (IDOP) in November, resources will be available soon on www.idop.org. The Religious Liberty Partnership is a collaboration of Christian organizations from 25 countries focused on international religious liberty for all faiths. It seeks to promote intentional work together on advocacy, research, training, and assistance, as well as raising the awareness of religious liberty violations worldwide.